Life has been pretty busy lately. A very good friend had asked me to be her Maid of Honour so I was busy planning her hen do, as well as still working on the house. I did managed to squeeze in making a couple of t-shirts for her. 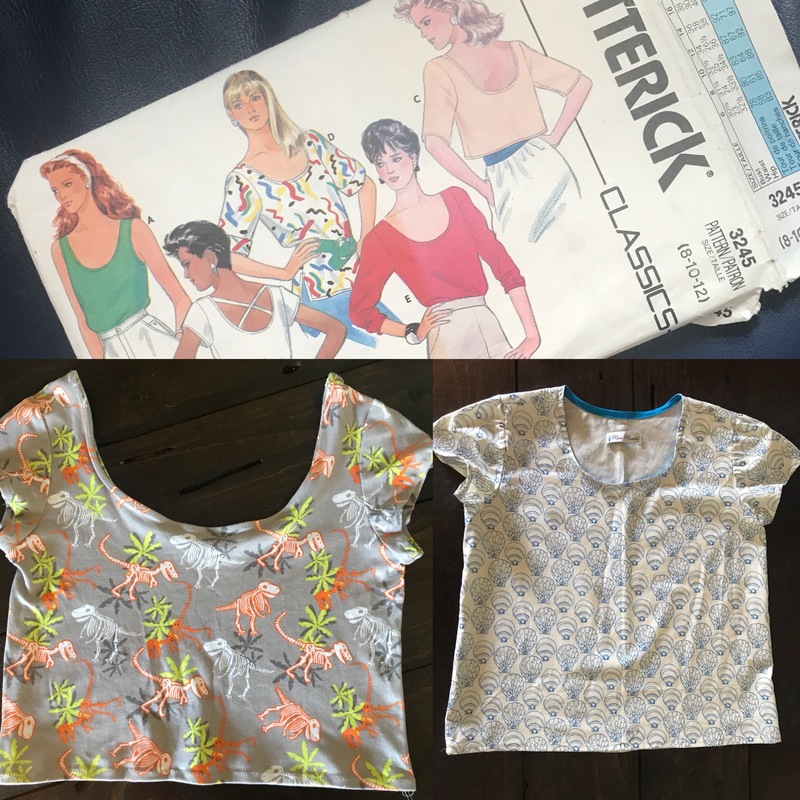 One was a cropped knit t-shirt from a vintage Butterwick pattern, the other was the Grainline Scout Tee. Unfortunately neither of them fit her! 🙁 Basically this was the beginning of all my troubles. In between planning and going to the hen do and later, altering my bridesmaid dress and then going to the wedding -which was FAB (I got my dress from a local bridal boutique and I love it) I signed up to pattern test for an indie pattern company. Once back from the wedding up in Philadelphia I decided to try out the test pattern I’d signed up for. I’m not going to mention the pattern or company as it hasn’t been released yet. This was my first time testing and honestly, I’ve found it really tough. First of all I made the pattern as it was, straight out of the envelope as the phrase goes, but really after sticking THIRTY-SIX PAGES together (not bitter at all). The pattern went together fine and the instructions were great. Unfortunately for me, as I’ve mentioned, patterns weren’t drafted for someone built like me, so of course it didn’t fit me (waaaaay too much fabric between my chest and bust) so I set about trying to alter it. With the Deer and Doe Girve, I Iearned that I needed to shorten my bodices between my chest and my shoulder. This is all well and good for something as simple as a tank, but this test pattern is made from princess seams, one side piece starting mid armscye and one shoulder/front piece. I tried my best to shorten them but clearly I messed up the armhole as I couldn’t move my arm. 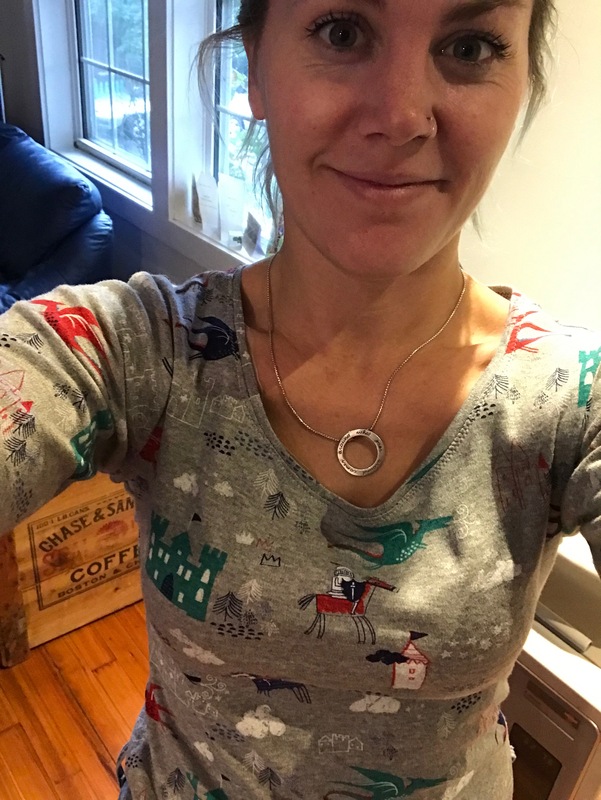 After bugging poor Mary over @toastedthread a million times (she’s testing it too) we decided I should try a smaller size as it was way too wide for me. I made the XS and while it helped, I felt it still needed shortening. I did this, and yup, arm scye wasn’t right. 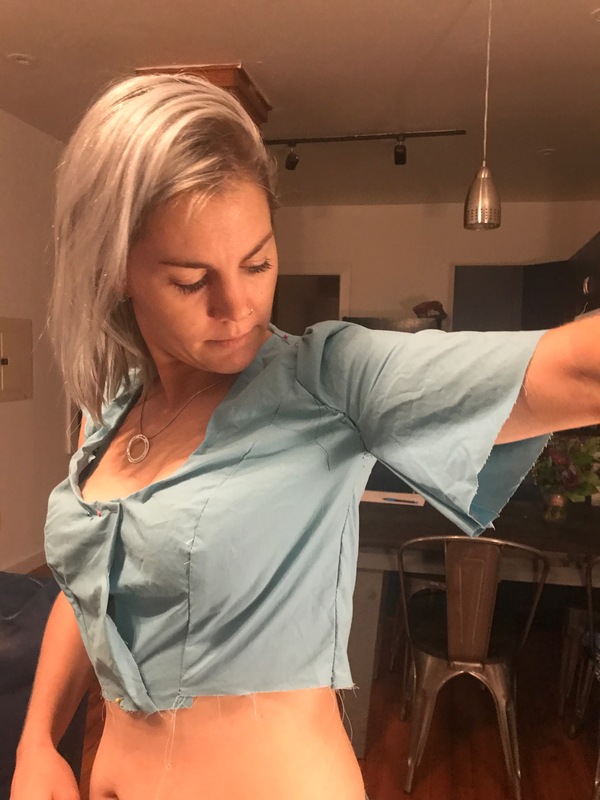 I went on to try scooping it out, didn’t work, to adding in fabric to see if that helped with mobility – still didn’t help. I think I was about 4 muslins in by this point when the pattern designer sent an updated version based on feedback she’d had. I got excited, thinking this might solve my problems. I made the XS again and took out 1/2 inch in the bodice length above the chest. It definitely fit better that my previous versions in that I could now move my arm but there was still so much fabric around my armscye. If I pinch out more it definitely helps but again, the arm scye gets all messed up so I feel like I’m missing something. Please ignore the zigzag stitches, this is just me experimenting with shortening. The shoulder seam feels like it is in the right place, as does the bust. It’s been SO frustrating, there’s definitely been tears. On the advice of again, the lovely Mary, we decided I should take a break and make a little pallet cleanser, something I know that fits and is quick to put together. I decided to go with a t-shirt version of my Girve pattern but I wanted to make View A this time. I’d done all my alterations on View B but figured it wouldn’t be that hard to transfer them to View A – WRONG! Somehow I’d managed to either not write down the changes I made, or lose the piece of paper. So instead of an easy quick make I spent about FIVE HOURS figuring out the changes from the original, tracing and creating a new version – bleurgh. 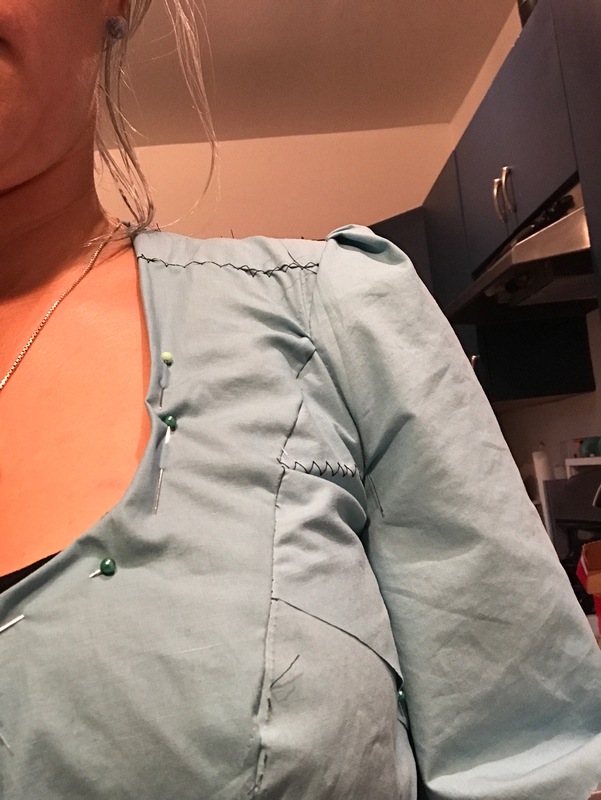 I sewed up the shirt which definitely doesn’t have the excess bust/chest fabric but belatedly I realized I forgot to narrow shoulder adjust so it slips down my shoulders – no tears, but maybe a little stamping of the feet this time! I was thinking that while writing this, this was my third disaster in my recent sewing adventures so hopefully this marks the end of it! I’ve got a Friday Pattern Company Vernazza Two Piece cut out – maybe I’ll give that a go and have some success? I’ve looked high and low for help with petite alterations to princess seams but without much success. Everyone raves about Fit for Real People but there is barely any detail about shortening bodices and definitely nothing about princess seam shortening, just adjusting for full or small bust. 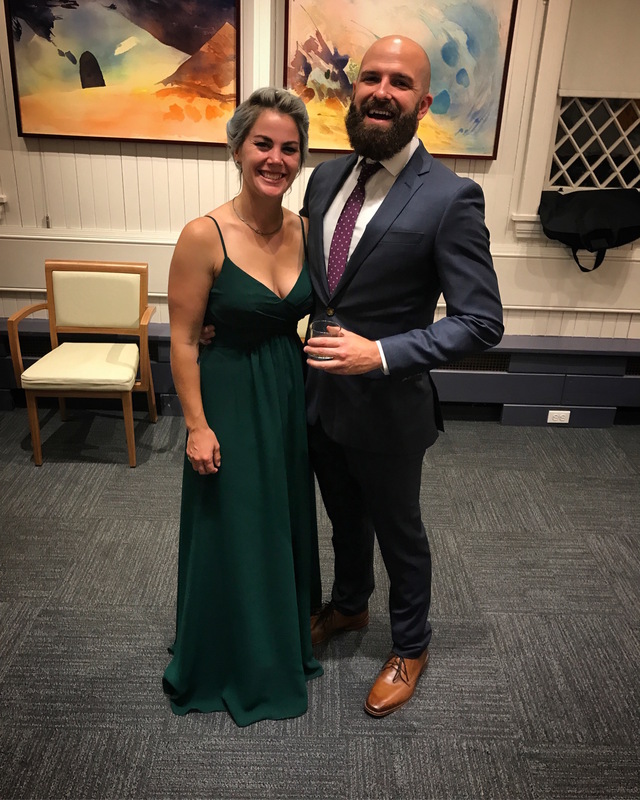 Hopefully next time there will be a much happier post!